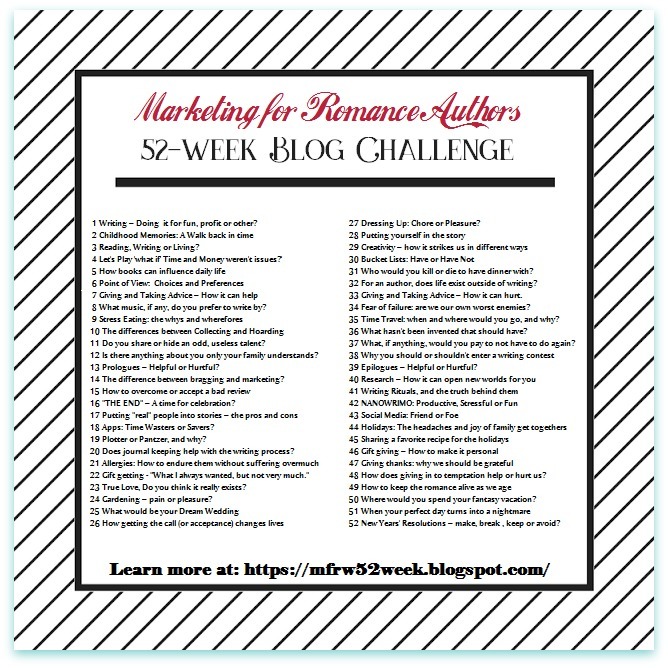 It’s already Week 15 in the 52-Week Blog Challenge Blog Hop. I’ve been so bad at this challenge, but when I decided to do this, I knew I wouldn’t be able to participate each week. 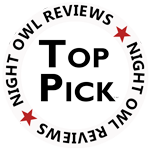 And that’s okay according to the rules at Marketing for Romance Writers 52-Week Blog Challenge. Feel free to Follow, Friend, Like, Peek, or visit now and then to see what is going on. I don’t spend a lot of time on any of my sites, but Facebook and Twitter are the ones I use more regularly. Website/Blog: You’re here now. 🙂 Thanks for visiting. Facebook Personal Page: “Personal pages” have a limit of 5000 Friends but unlimited Followers. Facebook Author Page: I don’t use this as much as my personal page, though I’ve considered moving most of my posts to my author page. Unfortunately, most of you don’t get to see my posts there because Facebook wants me to pay to boost posts so you will see them. Our “Facebook Pages” (author page) have unlimited Likes and Followers. Twitter: I’ve been lax with Twitter too but once this next book gets out, I plan on going back to regular Tweeting. When I’m on a roll with regular posting, I use Buffer to schedule posts. I don’t use the following social media sites as often as I should. Goodreads: Now owned by Amazon. Google Plus: You can join groups/communities. This is great if you like to join Hangouts. Google Hangouts is a communication platform developed by Google which includes instant messaging, video chat, SMS and VOIP features. Credit: Wikipedia. LinkedIn: I do have a profile here, but I’m invisible, meaning I don’t post anything or do anything here. In fact, I’m not sure how an author should use LindkedIn. Visiting my profile minutes ago, I realized I was three books behind, so I updated that part of my profile. Author’s Den: I post my books here. There is more to do on this site. As I’ve said, I don’t keep some of these sites updated like I should. My goal right now is to “write books” instead of spending a lot of time on social media. I try to post on Facebook and Twitter daily. Sometimes I run out of things to post about, so I’ll share something from other Facebook pages. I’ve been on Facebook for many years and some Friends have been with me since the beginning. When you Friend or Like a page, make sure you check to Receive Notifications so you will see posts. I appreciate your visit today. Please Visit the other participants. ← #AmWriting This and That and a Short Snippet Saturday Peek~ Plus A Spring Fling Contest! Thank you so much, Maxima. Happy Easter. I giggled at your disclaimers regarding how much you’re on each site. I’m the exact same way, Mary. It’s impossible to cover all the social media platforms. We’d never have time to write! Happy Easter, my friend. LOL, I’m glad I got you to giggle! You get it for sure. Happy Easter to you, too. Thanks for taking the time to stop by. I’m so behind with visiting blogs, again. 😦 At least I got one written. 🙂 I’m doing a final, final, final, final, proof. Did I mention that it was a final proof? Author’s Den sounds interesting as a reader and as a writer. I’ll check it out. Yes, I’ve been with them for a long time. As far as marketing, Alicia, it can be what you make it with the paid version, but still cool with the free. (I’m not affiliated with them.) Thanks for visiting. Learned something else new today. I didn’t even know what the notes section was on Facebook. I have thought about setting up a profile ‘personal’ page for my pen name but then my author page wouldn’t be linked to it because it’s attached to my personal ‘real me’ page. When I first set it up, I wasn’t fully aware of all the in and outs of pages. If only I could turn back time and do it over. Oh well. As it stands now I join writer groups under my personal name. I wish FB would let you interact in groups and such from your pages instead, but oh well, gotta make it work as best I can. Give the Notes a try to see if you like them. I think with Facebook you called it right… “Gotta make it work the best I can.” I don’t Boost posts so I take the chance of it being seen, or not. I basically post for readers who might make their way to my page from links in my books, newsletter, or wherever they may find my link. I am in a few groups but it seems most of those groups are other authors. I love learning from them, but I also want readers. Of course, authors are readers. 🙂 I’m glad you stopped by, Meka. You can have more than one Page on FB, so maybe you can set up your pen name after all. I don’t know anything about keeping them separate though, or how authors go about setting up a pen name with their personal profile. Good luck. I also have a dichotomy between my personal profile and my author page. Because more posts go to the personal page I tend to have to share from the personal to the author page. Someday I’ll get it figured out. I share some things to my FB author page, but then it just shows up in the sidebar on my Page. It works fine to share something from my Page to my regular profile. I’d rather use the regular profile page where my posts are mostly seen. This was the other comment I found in Spam. So sorry to reply so late. Thank you for visiting, Helen. Author’s Den? I really *should* look into that… but there are so many things I should do. It’s should-ed me into a corner. 🙂 Hang in there Mary. TGIF. Hugs. Authors Den does have free and paid membership. You should check it out. I use free but I had used paid in the past. Then I forgot my password for years and couldn’t get to my site, but a member put me in touch with the right person to contact to change my password. Now, I basically only post my books. I don’t dare get into Pinterest because I know I’d spend forever there. I will one day though. 🙂 Have a fabulous weekend, Teagan. T.G.I.F.